Also known as Ward's Tilefish, Horsehead and Moon Fish. 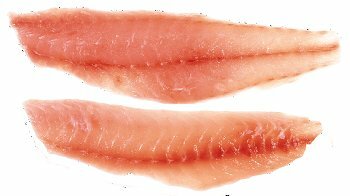 Two species of tilefish inhabit NSW waters - the pink tilefish, Branchiostegus wardi, and the less commonly caught barred tilefish (branchiostegus serratus). They mainly inhabit depths between about 50 and 200m although the barred tilefish has been caught as deep as 350 m.
Both have a relatively restricted distribution along the east coast of Australia, between Noosa Heads in southern Queensland and Jervis Bay on the NSW south coast. The pink tilefish has also been reported from New Caledonia and New Guinea. The Tile Fish has a reddish body with mauve tonings, golden yellow fins and a snout the shape of a horsehead. The caudal fin is straight and has a dark blotch on the lower half. The pink tilefish is mainly plain pink on the body, grading to pink/white on the belly and has a colourful caudal fin bearing two broad yellow stripes in the centre, a dark triangular patch on the lower part of the fin and yellow and grey on the upper part of the fin. B. Serratus is more silver/white in body colour and has about 15-16 dark vertical bands prominent on the upper body. Pink Tilefish prefer mud, gravel or sandy substrates, and they are reported to live in burrows. Taste, Texture White flesh, fine texture, Average rating. Tilefish feed on molluscs, worms, squid, crab and small fish. Tilefish larvae are pelagic with distinct patterns of spines along the head and on their scales. These spines are shed when the larvae develop into benthic juveniles. Pink tilefish grow to about 50 cm maximum length, with the majority of small fish (<30 cm) being female and male fish dominating the larger size classes. Almost all the NSW tilefish catch is landed by fish and prawn trawlers working off Newcastle - Port Stephens and is comprised mostly of pink tilefish. The annual catch has reached 11 tonne, but is mostly less than 5 tonne. Tilefish are marketed as fresh fish, mainly in the Sydney markets. Little has been published in relation to the biology of the species. It is a white fleshed fish and the texture is fine. It is not rated highly as a table fish. With their diet of crab and crustaceans their meat takes on a scallop lobster like flavor with a firm texture that is usually tender. The tilefish can be sautéed, grilled, baked, poached, steamed or even used for sashimi. Tilefish are extremely delicious, featuring firm, pinkish flesh reminiscent of lobster or crab. Cooked properly, the meat is succulent and mild-flavored, remaining moist after cooking. This makes it perfect for baking or broiling, and also for chowders and seafood stews. Pink Tilefish (Branchiostegus wardi) comprise a small but valuable incidental catch by trawlers fishing at depths of 100 to 250 m off south-eastern Australia. The majority of landings occur off central New South Wales, between Sydney and Crowdy Head. The Environmental Impact Statement for the NSW Ocean Trawl Fishery concluded that pink tilefish were at ‘moderately-high’ risk from the operation of the fishery due to a lack of knowledge about the species’ biology. Monthly sampling of catches of pink tilefish commenced in mid 2008 to determine the size and age composition of the exploited stock, and to investigate the size at maturity and the reproductive biology of the species. The size composition of the trawl catch is bimodal – the mode of smaller fish (30 to 40 cm TL) is comprised mostly of mature female fish, while the larger fish (40 to 50 cm TL) are all males. Although mature, none of the male fish sampled to date have appeared to be in ‘running ripe’ condition, whereas females have been found to be in a well developed state with hydrated ova in all samples. The males also posses a muscular sac-like organ between the testes – the function of this organ is unknown.